Vancouver homes purchased by recent immigrants are worth a third more on average than those owned by Canadians, a government study found. People who moved to the Pacific coast city between 2009 and 2016 own 5 per cent of the detached properties, which are worth $2.34 million on average, or $824,000 more than those owned by people born in Canada, Statistics Canada reported Tuesday. 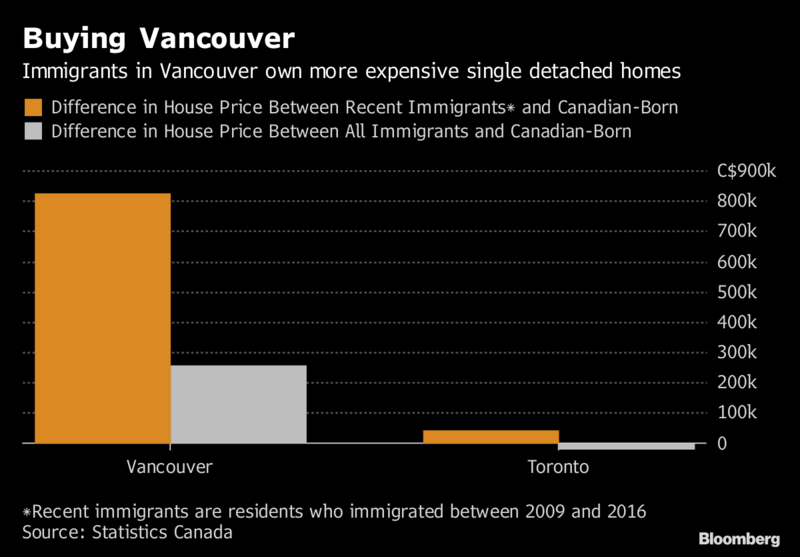 The gap in Vancouver prices is much larger than for immigrants who arrived earlier, and the same pattern doesn’t hold for Toronto, the agency said. The report is one of the most detailed yet on immigration and housing in Vancouver and Toronto, the nation’s two most-expensive real estate markets. Policy makers are seeking to get a handle on the decade-long housing boom that drove prices to unprecedented levels, creating record household debt burdens and an affordability crisis. Tuesday’s report said the role newcomers play in the Vancouver and Toronto real estate markets reflects the large share of the population they represent in each city. Immigrants own 37 per cent of homes in Vancouver and made up 41 per cent of the population in 2016, while in Toronto they own 43 per cent of homes and were 46 per cent of the population. Toronto’s recent immigrants own 4.7 per cent of single-detached homes worth an average of $892,600, or just $43,300 higher than other Canadian-born owners, the study found. It didn’t give a detailed explanation of why the shift to expensive homes in Vancouver by recent immigrants wasn’t mirrored in Toronto, saying a more detailed study would require many more years of data. The Vancouver price gap was even larger under an immigration program that targeted new investors in Canada. Recent arrivals to the city under that federal program bought single-detached properties worth an average of $3.11 million. Across several immigration categories, recent immigrants to Vancouver from China spent more on housing than people from nations such as India or the U.K.